A mere 479g in weight but able to punch way above that. ICAR Race Nippers are lightweight, compact, and thanks to highly skilled toolmaking and careful selection of the raw materials they will hold their edge extremely well. 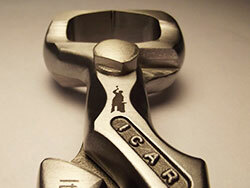 Forged in tradition ICAR’s range of farrier tools have been designed and made by craftsmen for the craftsman. Combining functional design with state-of-the-art manufacturing processes and using only the highest grade Italian tool steel, ICAR tools are a true investment in quality. Built from a high grade tool steel Smiths nippers are extremely hard wearing with incredible edge retention properties so they stay sharp longer! Ergonomics play a major part in the design so the handles are comfortable, and good leverage means less effort is required to achieve a clean cut. These are nippers for discerning buyers so if you appreciate true quality you’ll very quickly appreciate the ICAR Smiths nipper.